Meet in Casablanca Mohamed V airport upon your arrival and transfer to Marrakech. This takes 2h30 min. We will pick up in the morning. We leave to Ouarzazate by way of the High Atlas Mountains. In this itinerary we include several stops to take pictures of the panoramic and fascinating sights of Berber villages. 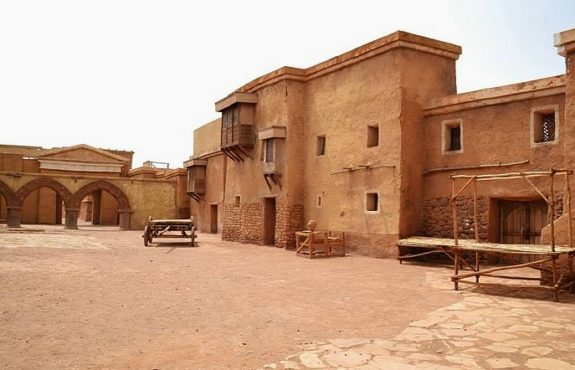 We visit the Kasbah of Ait Ben haddou which is a World Heritage site by the UNESCO. After lunch, we drive through the city of Ouarzazate towards the Roses Valley in Kelaa Mgouna. We spend the night in Kasbah . Kelaa M’gouna is located in the valley of roses. This Berber village celebrate every year the festival of roses. We visit a local factory for rose’s water extraction. Continuation along the way of thousand Kasbah till Tinghir, stop for Todgha gorges visit. Todgha River flows between this geological fault to irrigate the palm groves. Continuation to Alnif where after few miles we join the off road to Ramlia. We enjoy driving on off road meeting nomad people, crossing dried rivers and listening the desert Sahara stories. We reach Ramlia where we meet friendly Berbers with whom we spend fabulous moments. Night berber guest home. In the morning, we leave to Merzouga, on an off-road way alongside the Moroccan borders with Algeria. You will enjoy the desert ride and the vast and unlimited Sahara land with beautiful oases. We cross the unique Jdayed and Taouz Berber villages .Before Merzouga, we stop in the village to enjoy some minutes of Gnawa music rhythms. We reach the hotel.From here, you will ride your camel and start an amazing trekking experience tothe desert camp where you will spend the night having fun and enjoying your time listening to pleasant-sounding Berber Music. You wake up in your tent in the desert camp to enjoy the beautiful view of sunrise and take some pictures. You, then, ride your camel back to the hotel where you take a refreshing shower and an energizing breakfast before leaving to Midelt. We drivethroughthe village of Erfoud and the Ziz Valley where we will stop when necessary to take some pictures of the unique and amazing places and landscapes. We arrive to Midelt where we spend the night. We have our breakfast thenwe drive to Meknes. On our way, we will pass across the Cedar forest of Azrou where we will stop to watch monkeys and enjoy the landscapes around. We reach Meknes in the evening. This city is one of the Moroccan imperial city like Fez, Marrakech and Rabat. Itis made up of the old Medina and the new ville nouvelle. The Medina holds the city’s historic sights and while in the ville nouvelle you will find modern buildings. Sightseeing includes Mausoleum of Moulay Ismail, the basin Swani, the ruins of Volubilis, Bab al-Mansour,the Medina, Museum of Moroccan Art (Dar Jamai) and BouInania Medersa. At the end of you tour in the city, we transfer youto your riad. After an active day, we take you back to your hotel. At the afternoon we depart to Meknes via the Roman ruins of Volubilis.